Quality glass vase with wholesale pricing. 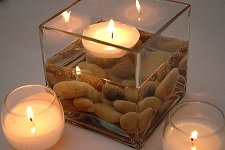 with a layer of decorative sand and top it with a candle to transport guests to a tropical paradise. Neatly organize and quickly find every item in the craft room, home office or bathroom by utilizing cube vases as attractive storage solutions. Keep track of beads and paper clips in a transparent vase. Easily access cutting tools and writing implements collected in the sturdy cube. Simplify the morning routine by collecting lipstick and cotton balls into cube vases. Restore order and decorate with style thanks to cube vases. Average Customer Review: 4.5 of 5 Total Reviews: 84 Write a review. Excellent customer service; especially the Chat service. Spend the extra few dollars elsewhere. All 6 of mine are not level with uneven cuts and chipping. Some vases are foggy / filmy that doesn’t wash off with dish soap. The tops of these vases are very poor quality, rough and choppy. Great price for cube vase. Let’s oks great and came very safely packaged. I haven't taken them to the florist yet but the price and delivery were perfect! (Better than they could supply!) The few that I opened, put of the impeccably packaged products to prevent breakage, looked great!